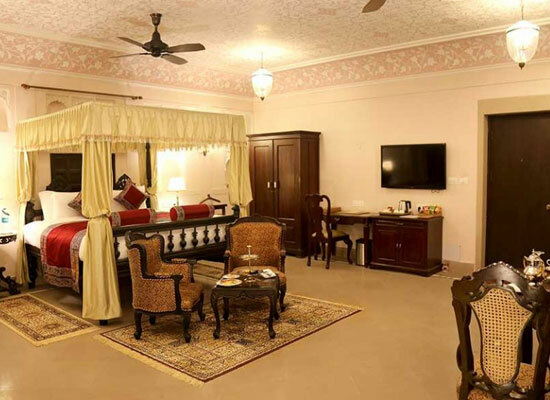 "Known to be one of the oldest buildings on the Varanasi ghat, Brijrama Palace on Darbhanga Ghat is now one of the best luxury heritage hotels in Varanasi. This is an 18th century Royal House of Nagpur, with touches of Maratha style of architecture. Maharaja Saheb of Dharbhanga in the early 20th century converted it into Dharbhanga Mahal. Greek architecture was added and the property had the first lift in South Asia. This heritage hotel offers a sneak-peak into its golden days and offers a memorable stay amid world-class comforts. The views of the Ganga ghats from the well-furnished rooms and suites are mesmerizing. The palace is accessible through a boat that one has to go on-board from Mahishasura ghat. The two restaurants serve choicest of dishes of India and World. The staff is extremely well-mannered. 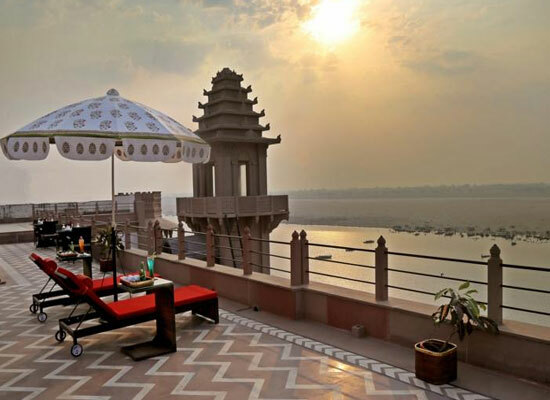 One of the oldest landmarks of Varanasi, Brijrama Palace is a beautiful property that is located on the banks of Ganga. Shridhara Narayana Munshi, the minister for the estate of Nagpur, commissioned this palace way back in the year 1812. The ghat adjacent to this palace is named after him, Munshi Ghat. Later, in 1915, Rameshwar Singh Bahadur, Brahmin ruler of Darbhanga took over this palace and then the ghat came to be known as Darbhanga Ghat. He made several additions to the structure of the palace. Then in 1915, the second floor was added to the palace and a lift was also installed. This was the first elevator in South Asia. 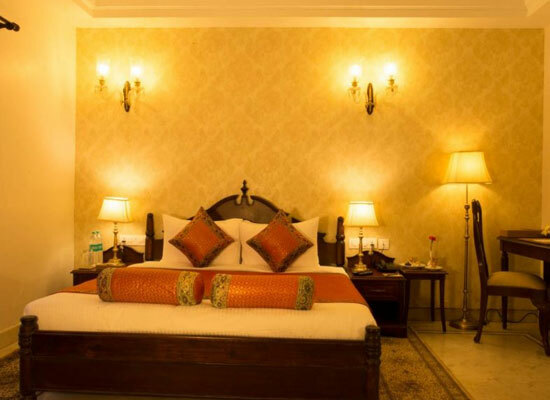 Today, it is a luxury heritage hotel in Varanasi. 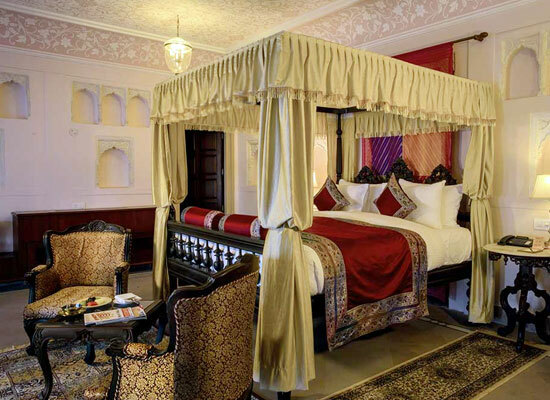 Accommodation at Brijrama Palace consists of rooms and suites, 32 in number. The rooms are elegantly furnished, have tasteful décor and have an amazing old-world feel. Guests can have a comfortable stay amid modern amenities and facilities. Admire wonderful views of the River and the surroundings while in the room. From your room or suite, step into the expansive and capacious corridors so that you can enjoy abundant natural light. Every guest floor has a seating space for some leisure moments. The corridors on the upper floor have carved terraces providing stunning views of the horizon and the Ganges. Sunrise and sunset views are unforgettable. Air-conditioner, four-poster beds, comfortable furniture, tea table with chairs, sofa set with center table, writing desk and chair, ceiling fan, wooden wardrobe, complimentary water bottle, telephone, attached bathroom, LCD TV with satellite connection, tea/coffee maker are some of the contemporary conveniences in the rooms and suites. The interiors are wonderful, color palette is warm and the services are hospitable. 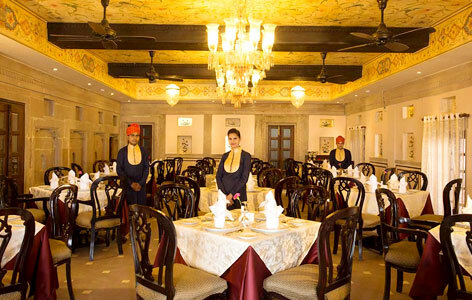 Dining experience at BrijRama Palace is delightful and memorable. Guests can savor finger-licking dishes of Indian and International flavors, prepared using freshest of ingredients and aromatic spices. Pick a covered seating space or enjoy an alfresco dining. The menu of both the restaurants include choicest of delicacies from world-over. Please take note that due to proximity to the Ganges, non-vegetarian dishes and alcoholic beverages are not served. Special dinners can also be arranged. The chefs take proper care of hygiene and taste. 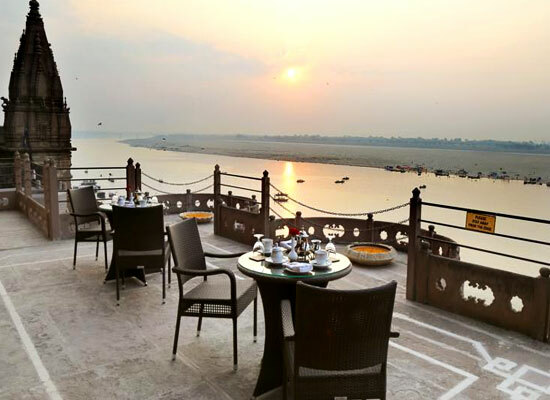 Overlooking the mighty Ganga River, Darbhanga is that special venue where the guests can savor traditional Indian vegetarian dishes. The chefs take ingredients and aromas from the Vedas. The recipes served are age-old. The décor of the restaurants is rich and impressive. Restored ceilings and walls with artwork and frescoes, look stunning. Kamalya Café & Terrace is a wonderful venue for savoring a wonderful range of finest of teas and fresh coffees. Specialty of the menu are some of the region’s traditional beverages such as Thandai, Saffron based coolers and flavored milk. Accompany these special drinks with a complete range of chef’s favorite dishes, serving regional as well as international aromas. Do not miss out special offering from the ‘Chaat’ section and enjoy special street food items. The venue has indoor seating and an alfresco space, offering the views of the Ganges. Located on the banks of holy Ganga River, Varanasi or Banaras is known to be one of the oldest inhabited cities in the world. The city boasts of a spiritual feel. During your Varanasi tour, do not miss out on some wonderful experiences such as early morning boat ride in Ganga River, magnificent evening Ganga Aarti, visit to ancient temples, shopping for special Banarsi silk saris, and savoring sugary and savory delights etc.